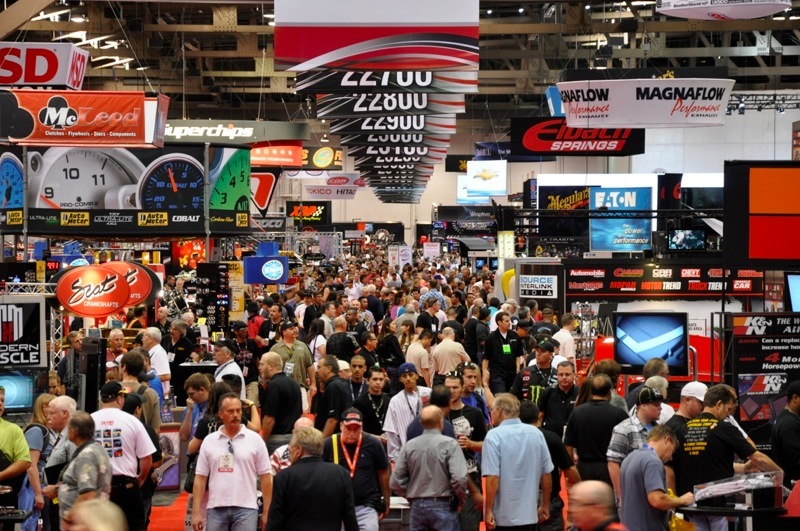 Every year during the first week of November, the Las Vegas Convention Center is taken over by the automotive industry. This annual event is not a car show, but rather a showcase of unique aftermarket car parts, put to use on the newest car models. At last year’s show, over 2,000 new parts, components, and tools were introduced to the industry. So, when you see aftermarket car parts in Albany, NY – they were likely introduced at the SEMA Show. With November literally just around the corner, the Las Vegas Convention Center is preparing for the “largest automotive specialty products trade event, in the world.” Registration is already in full swing, with the actual exhibit opening at 8:00am on Tuesday. With anticipation building around the latest and greatest car parts to hit the automotive aftermarket, plenty of automotive enthusiasts are getting a glimpse into the showcase. Nearly every name in the automotive world is present at this year’s SEMA Show, and Chevrolet is no exception. The Bowtie brand is exciting drivers across the world with new concepts, parts, and accessories that have never been seen before. The biggest names, and most prestigious companies to offer car parts and accessories, have teamed up with Chevrolet to create show stopping versions of the brand’s latest models. Chevrolet has long made it their mission to provide premium, reliable, and performance enhanced vehicles to the American public – and they are extending that mission at this year’s SEMA Show. Chevrolet announced their presence at the 2015 SEMA Show by saying that, “Our innovative lineup of cars and trucks uniquely embodies the spirit of ingenuity and holds endless personalization and performance possibilities.” Let’s take a look at some of that ingenuity and promise of innovation, that Chevrolet is showcasing at the SEMA Show next week. This Red Line Series version of the popular crossover features exterior Silver Ice Metallic paint, Satin Graphite accents, painted Gloss Black Bowtie emblems, a custom Charcoal roof panel, tinted windows, tinted tail lamps and headlamps, and a Chevrolet Accessories Roof Rack. 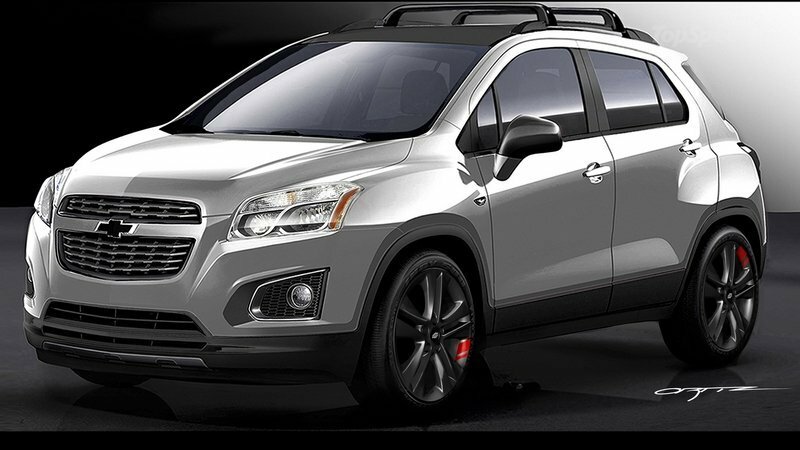 18-inch wheels with red painted accents, special grille surrounds and inserts, fog lamp bezels, and Red edging around the Trax nameplate, all help complete the Red Line Series exterior look. Inside the Trax, Jet Black leather seating, Satin Graphite interior trim, and a Gloss Black bowtie emblem on the steering wheel, are all part of the Red Line Series package. 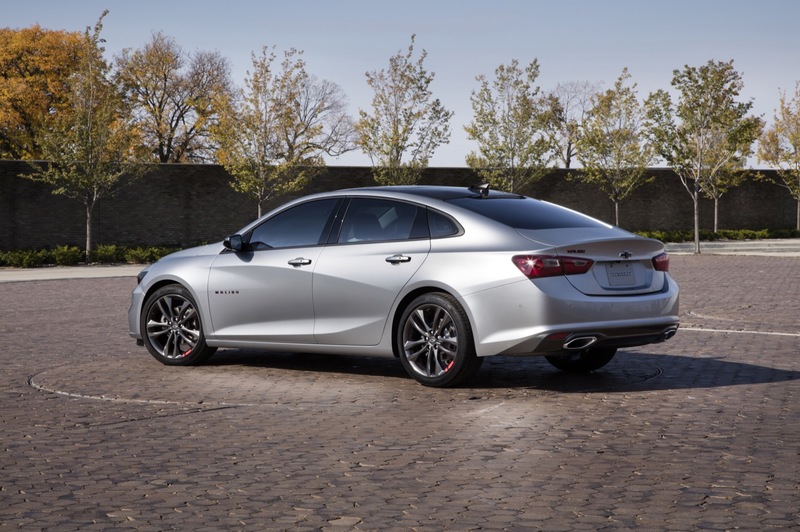 The midsize sedan is all-new for the 2016 model year, and so is the Red Line Series concept version of the car. The Malibu Red Line Series gets relatively the same treatment as the Trax, but also includes custom-painted skis and a snowboard, and the Chevrolet Performance Lowering Suspension system. The iconic sports car becomes even more intense with the Red Line Series treatment. 20-inch wheels with painted red accents, Camaro nameplates with Red edging, a rear spoiler, deck lid graphic, custom clear side markers, and custom repelling gear, all enhance the Camaro’s Red Series Line appearance. While the Camaro Red Line concept receives the same exterior and interior treatment of the other Red Line Series models, the Camaro also gains a 3.6-liter V6 engine that makes 335 horsepower and 284 lb.-ft. of torque. A direct injection, variable valve timing, and an active fuel management system, are all a part of this powerful V6. The Camaro Red Line Series also receives the Chevrolet Performance Air Intake system, which is currently a concept. 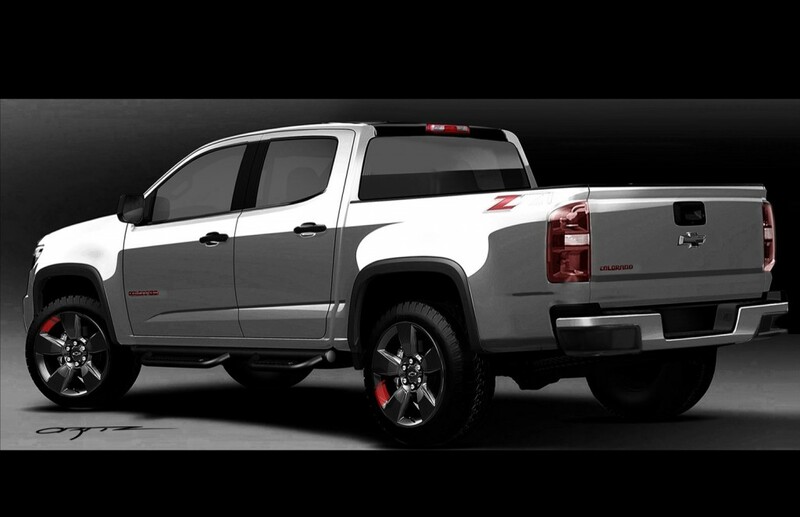 The Chevrolet Colorado Red Line Series Concept offers similar exterior specifications as the other Red Line Series models. 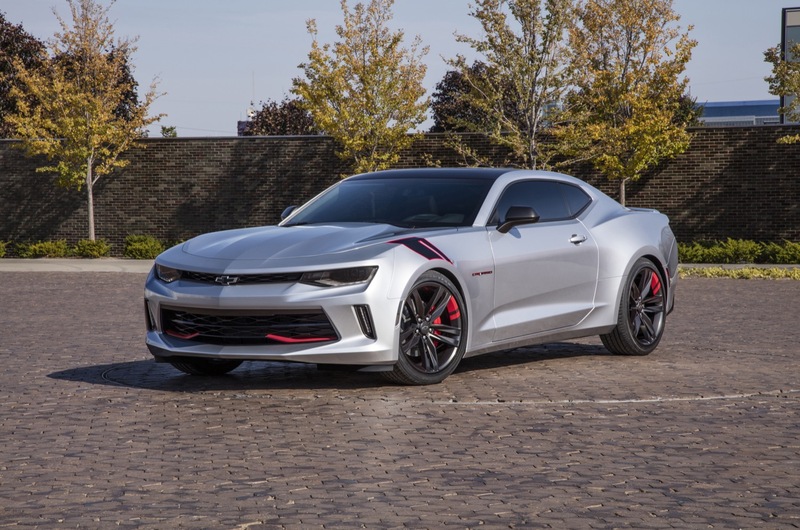 It also includes the Chevrolet Accessories Sport Assist Steps, Red tow hooks, custom fat tire bicycles, and the same 3.6-liter engine with Direct Injection and Variable Valve timing, as the Camaro Red Line Series Concept. Chevrolet’s full-size pickup truck was not left out of the Red Line Series concepts, and received its own unique take on the concept. 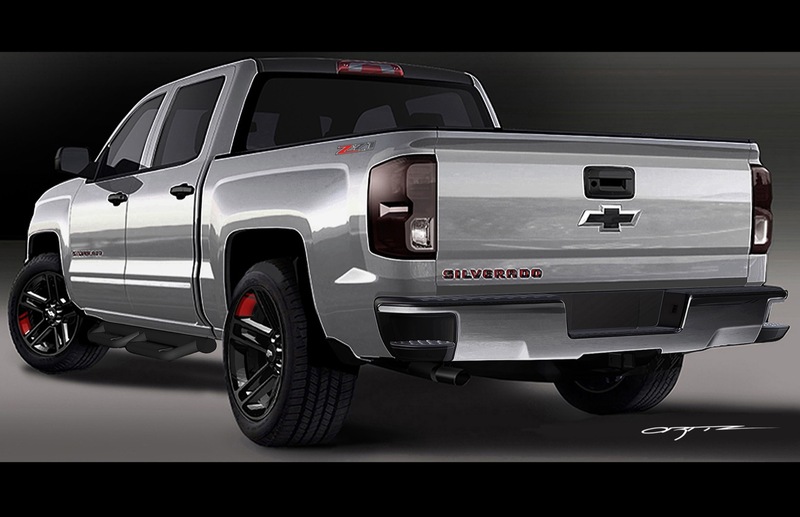 A custom Z71 bedside decal, 22-inch wheels with painted red accents, Chevrolet Accessories Assist Steps with red accents, custom painted red kayaks, and Satin Graphite accents were all added to the Silverado Red Line model. The full size pickup also gets a 5.3-liter EcoTec3 V8 engine, which boasts 355 horsepower, and 383 lb.-ft. of torque. Another big showstopper for Chevrolet at this year’s SEMA Show, is the 2016 Chevrolet Spark R/S Concept. The design of this concept came about when the GM Design Studio here in the United States collaborated with the GM Design Studio in Korea. The result? A Spark Concept that was born from the 2016 Chevy Spark 2LT, and given the dynamic performance and appearance of Chevrolet’s R/S package. The Spark R/S Concept will be showcased at the 2015 SEMA Show next week, and features a sporty, aggressive appearance, complete with a carbon-fiber front splitter, a rocker extension, and RS badging. 17-inch Corvette inspired wheels are painted with custom Dark Liquid Switchblade Silver, and feature Dark Android wheel pockets. A faux carbon-fiber Rally Stripe decal adorns the exterior from the grille to the back bumper, and the interior of the Spark R/S comes with R/S embroidery on upper seat backs, an R/S emblem on the steering wheel, and High Gloss Black hard trim parts. Everything about this concept is sparking the interest of automotive enthusiasts, especially those who are familiar with Chevrolet’s R/S package on past models. These concepts that are being showcased by Chevrolet this week at the SEMA Show, are just a sampling of what the bowtie brand has in store. Chevrolet has teamed up with a number of custom car parts and accessory companies, in order to bring about the most in-demand and popular products to SEMA. We will be reporting on the latest from the SEMA Show all next week, and highlighting all of the impressive parts and models that Chevrolet unveils. The best part about the annual SEMA Show, is that most of the parts and accessories that are showcased, are actually available for Chevy owners to purchase. Whether you want to add a new and unique look to your new 2016 Camaro, or want the entire Red Line Series package, you will have the opportunity to do both at some point in time. Chevrolet has not announced when the Red Line Series will go from concept to actual product, but the automotive company is making it clear that they intend to offer these models in the near future. 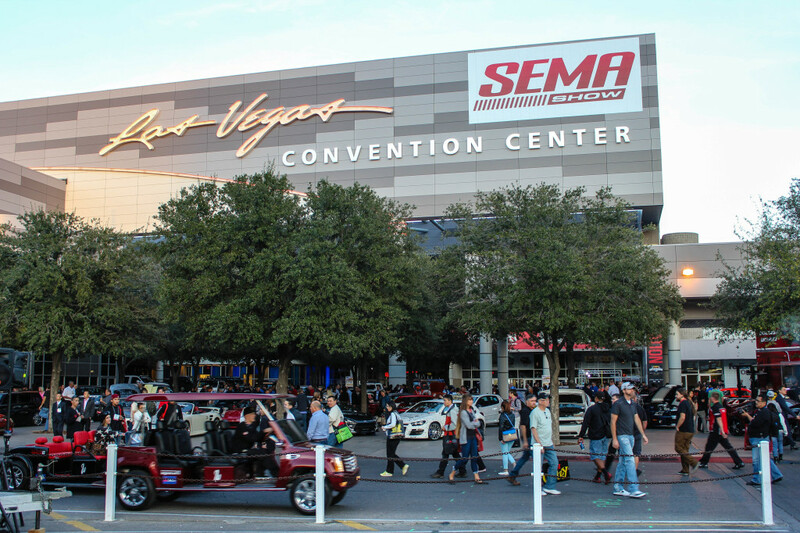 Be sure to keep checking back at the DePaula Chevrolet blog, for the latest information and product parts to come out of this year’s SEMA Show next week.